The first American settlers on the west coast arrived on the Columbia River in 1811 by sailing ship. They came via the toughest sea route in the world–westabout around Cape Horn. For the next century, the Pacific Northwest depended on these ships to keep its economy growing. That trade died out in the 1920s, but was revived in 1941 for one final curtain call, driven by the demand for lumber for the mines in South Africa. A handful of neglected sailing ships were saved from the scrap yard, re-rigged and over-loaded with lumber, and sent out with crews of young Americans. They were completely unprepared for the hazardous voyage that lay ahead of them, but no one was lost. By the 1980s, there were only a few old sailors left from that adventure, who could remember when the need for work and desire for adventure led them to sign on for a long perilous voyage under sail. 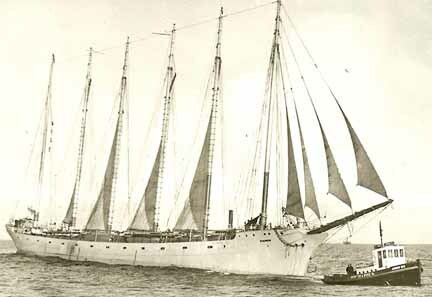 The last of those American-flagged sailing ships to round Cape Horn was called the Tango. The history of its voyage was preserved by a remarkable Columbia River writer, Larry Barber, who was by then himself in his late 80s. The fascinating history of the 396’ German bark, launched as the Hans, reveals it was interned in Mexico 1914-21, turned into a gambling barge anchored in Santa Monica Bay 1935-39, then finally re-rigged as a six-masted lumber schooner in 1941. I met Larry when the book was published in 1989; when he died in 1997, I began to learn about his life as the “marine reporter” for the Oregonian newspaper from 1938 to 1962. Since the publisher had no interest in continuing to market the book, I took it on to keep the story alive. Luckily for Larry, the early years of the Tango had been researched by two authors who were captains under sail, and understood the importance of preserving the history of one of the last, great sailing ships. The Tango began life in 1904 in the yard of William Hamilton & Co., Port Glasgow, Scotland as the Hans. By this time, European shipbuilders had perfected the construction of steel, sailing ships, six of which are still afloat in the U.S. The Hans and its sister ship the Kurt were completed to the highest classification of Germanischer Lloyd. The cost was about $2 million each and these were the last sailing vessels Hamiltons launched before turning exclusively to steamers. That year there were 3,500 sailing ships registered at Lloyds of London. The new Siemers ships were among the biggest carriers afloat: their cargo capacity was 5,400 long tons in four holds on a waterline of 335 feet. Beam was 47 feet and depth of hold 26 feet. The rig was four-masted bark (or barque), the fore, main and mizzen masts were steel tubes 198 feet high, the jigger (mizzen) was 153 feet from heel to truck. The lower spars were 91 feet long and the bowsprit was an impressive 64 feet. The rig comprised 18 square sails and 17 fore and aft sails, for a total of 56,000 square feet of canvas. (About the area inside a running track.) The captain had a suite of six rooms, trimmed in marble, brass and mahogany. The Kurt, sister ship to the Hans, was interned in WWI and anchored off Astoria. The Treaty of Versailles enacted punitive demands against Germany — which led to the rise of Nazism. The entire, German, merchant fleet, thousands of ships, was taken as reparations. That included the rusting sailing ships in Mexico. After 6 1/2 years of idleness, the Hans now moved into the hands of the first of seven more owners –Captain Robert Dollar, head of the Dollar lumber empire. Dollar had acquired the entire fleet for a bid of $350,000. Then the newly-named “Mary Dollar” sat and waited. Only four Dollar ships sailed with cargoes in 1921-22. There was a brief flurry of activity in 1927, which emptied Dollar’s moorage in the Bay Area. The Kurt was sold to a Finnish owner, re-named Moshulu, worked until 1939, and finally found a resting place in Philadelphia. Dollar died in 1932 and these were the Depression years; there were no takers. They offered it as a gift to the state of Washington as a school ship — it was turned down. Finally, a Captain Charles Watts of Berkeley took it off their hands, reputedly for $3,500. He soon turned the ship around and sold it to a Nevada gambling syndicate, It looked like the end of the road for this proud ship. 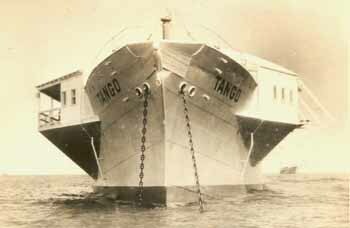 The Tango was converted into a casino and anchored off Long Beach, California in the 1930’s. It was towed to Wilmington, where the towering masts were lifted out and scrapped. The deck was cleared and an imposing, warehouse-like building, 280′ X 60′, was erected. Strings of lights were hung around the ship to create a festive atmosphere. The Tango was ready to begin its new career as an offshore, gambling ship. It joined a small pirate fleet anchored off Redondo Beach. The single cabin, almost a hundred yards long, was soon filled with gamblers, ferried out from Los Angeles. There was undoubtedly a lot of underhanded dealing going on, but the authorities weren’t particularly concerned until the ships started running bets on horse races. That cut into the state’s revenue from the tracks. What followed was dubbed “The Battle of Santa Monica Bay” by the local papers. Whenever Sheriff Eugene Biscailuz felt his men needed a little exercise he would send them out to raid the ships, looking for evidence of law-breaking. The L.A. Times described one encounter when the crew of the Rex kept the posse at bay with high-pressure fire hoses! In August 1939, the courts ruled in favor of the state and re-drew the three-mile limit from the headlands instead of the bays. The game was over. The Tango passed two more years in lay-up, until the world again turned to war to solve its disputes. Shipowners soon spotted a profitable opening as trade routes from Europe were cut. South Africa needed lumber for its mines, and American ships were still neutral. A total of six sailing ships were found and re-fitted, then sent off on that trade. All delivered their cargos but none ever returned to the west coast. Some east coast investors decided to get in on the action during the summer of 1941, incorporated as the Transatlantic Navigation Co. and hired an experienced sailor, Captain Asa Davidson, to locate a seaworthy hull. He found the Tango in Wilmington and bought her for $25,000 after a quick inspection. The big, gambling house was torn off, 2,500 tons of ballast removed from the bilges. The ship was lifted at the Los Angeles Shipbuilding drydock on September 4, 1941. It had been afloat for 27 years and some 40 tons of barnacles were scaped off. The hull was found to be in excellent condition, except at the turn of the bilges, where the small pits were spot-welded and the larger ones covered with doubling plates. All the gear cut away for the gambling venture – coamings, bulwarks, deckhouses – had to be replaced. Then new accommodations had to be built for the coming voyage. The question of how to rig the hull was problematic. Captain Ferrell Colton, who had served on the Moshulu, was hired as an advisor and wanted to see the original, square rig re-created. 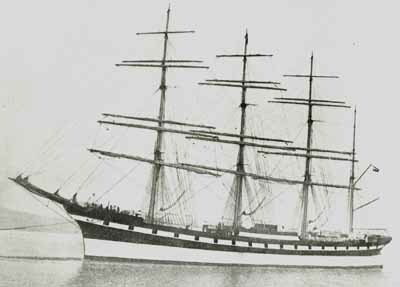 The owners were more influenced by economy and went for a simpler gaff rig as had been used on the Star of Scotland. 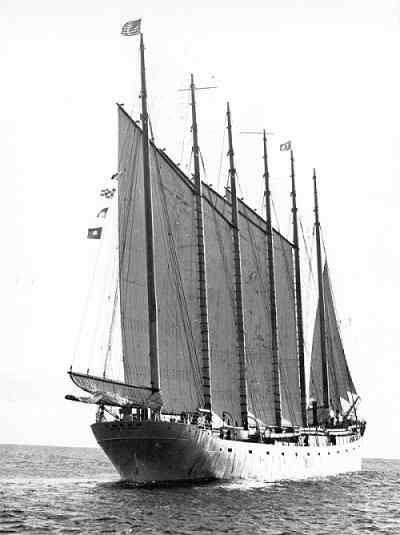 The Tango became a six-masted schooner, a type that had been developed and perfected by American sailors. Larry Barber had visited and reported on the Tango for the Oregonian. For the next 40 years, Larry had assumed the subject was closed. Then, in 1985 he learned that two of the crew were still alive, and living nearby. He met up with them, heard their stories about the voyage, and resolved to turn this material into a book. It was an ambitious goal for any would-be author, and Larry was nearly 90 years old. But ultimately he succeeded, and the book was published by the Oregon Maritime Center and Museum in 1989. After Pearl Harbor, the work on the Tango continued with added urgency. Six, 63′ steel tubes arrived from Wyoming where they had been used on an oil rig. They were set through the deck, on the keelson. The spars were prepared from logs felled beside the Columbia River in Oregon. They were turned at the Portland Spar Company, the last operation in the nation that maintained the ability to turn a 120′ log. The masts, gaffs and booms were delivered to the ship by rail on three, flat cars and hoisted aloft. The final height of the masts above the keel was 165 feet. In January 1942, the Tango was towed up the coast in ballast under the command of Captain Carl B. Gundersen of Brooklyn, New York. He was a Norwegian native who had commanded the Tusitala, a full-rigged ship that was used by the wealthy owner James Farrell in the 1930s. The Tango was berthed at the Pope & Talbot lumber dock in St Helens, Oregon, downriver from Portland. During April, over 3 million board feet of Douglas Fir was crammed into the hold and piled 6′ high on deck. Most of it was 2 X 12 in varying lengths. At the same time, the rigging and deck gear was completed, a steam donkey engine fitted to aid with deck work and a 70′ bowsprit fitted. The canvas sails were sewn in Long Beach and trucked north. There were six, identical, gaff sails and three spares, each 102′ X 46′. Their names from the bow aft were: “fore, main, mizzen, jigger, driver and spanker.” The four jibs were the “flying jib, outer jib, inner jib and forestaysail.” There would be no sea trials, the first test of the new rig and the raw crew would be when the ship was cast loose on the Pacific, next stop South Africa! The date was April 1942, four months after Pearl Harbor, and the entire country was gripped with war fever. Lookouts kept watch along the coast, scanning the horizon for Japanese ships that might try to land guerillas or a full-fledged invasion force. In St Helens, Oregon, security was tight as stevedores loaded 3,110,000 board feet of timber onto the first sailing ship seen on the Columbia since the 1920s. 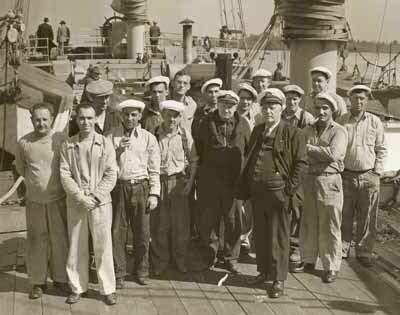 The crew of the Tango looked like a good bunch, but had never set foot on a sailing ship before. No news of ship movements was permitted by the military censors, but a 360′ sailing ship, with masts standing 150′ above the water, was not something that could be hidden and word eventually reached Larry Barber, the marine editor of the Oregonian newspaper. Although he had access to all the Kaiser shipyards, even he couldn’t get onboard the big sailing ship. All he could do was take some photos from the dockside. On sailing day, April 29th, he was back to record the ship’s departure. A small crowd had gathered on the dock,” he recalled. Now that his ship was ready for sea, Captain Gundersen relented and allowed the newspaper man onboard for the last hour at the dock. They lined up the crew for a group shot, Larry wrote some brief notes, then he was ushered down the gang plank as the stevedores cast off the lines. A couple of tugs turned the ship into the current and the last voyage of the Tango was underway. May 2nd 1942, it anchored in Astoria, as last-minute stores were taken aboard and three more crew arrived. Barber had driven downriver and was on the Columbia Bar Pilots’ schooner Columbia to record the moment when the Tango first hoisted sail. Apparently Captain Gundersen was now in a confident mood, because he allowed the cameraman to row over to the ship while the convoy was underway. The tug was led by a minesweeper which followed the unmarked channel out so sea. That was the last that was seen or known about the Tango for many months. But that moment in time was preserved in Barber’s photos. When they were returned from the censors, one picture filled the entire front page of the Sunday Oregonian on May 24th. Watching the Tango raise sail and disappear over the western horizon made a powerful impression on Barber, and he never forgot this episode. He was also not one to give up on a story and he wrote short pieces for his newspaper in 1954 and 1975. With the journals of Archie McPhee and Fred Bitte at hand, Larry was working steadily on his manuscript in 1987 when both men died within a month of each other. Despite this loss, the book was finished, only to be rejected by numerous editors. The Tango was towed across the Columbia Bar and into the Pacific. Bitte, a seaman and McPhee, the donkeyman-mechanic, looked back on their adventure with typical pride–but their writings told a story at odds with expectations. The excitement around the ship had dissipated before they were out of sight of land and the crew quickly became disenchanted. Because they were all members of the Sailors Union of the Pacific and the captain was one of the “old school,” the voyage would be marred by constant friction. Captain Gundersen assumed the crew had signed up because they wanted to gain time under sail, but most were drawn by the pay more than the romance! The wages were good for the time: the able-bodied seamen were reportedly getting $310 a month. Gundersen had never encountered a crew that held regular union meetings, then elected a spokesman, Joe Kaplan, who was a member of the Young Communists League! Unfortunately, things were equally acrimonious between the crew members themselves. They were never short of complaints–especially about the food. The cook had been paroled from prison on his promise to go to sea, with the hope that this would pay off some of his unpaid alimony to three wives! He refused to provide lunches for the night watch and tried to lock the galley at night. Within a week of leaving Astoria, trivial matters had flared into physical confrontations. The Tango ran on uncaring and McPhee noted that they’d logged 12 knots for two hours. The next day, May 9th, he added that the ship had logged 18 knots for a few minutes. By the time the Tango reached the Equator, on June 5th, there was so much disagreement that there was no attempt to hold a Neptune’s Court. McPhee refused to join in the griping however: one day he shaved his head, on another he rigged a bosun’s chair on the end of the bowsprit which gave the occupant a wet and wild ride. The Tango is towed across the Columbia Bar. Only five of the ten seamen had any experience under sail, one was a stowaway from the delivery trip and two had never even been to sea. On June 15th, while attempting to gybe the mizzen in 40 knots of wind, a lack of communication resulted in some men letting go of the sheet while one hung on and was hoisted out over the ocean. Ira Cheney, the stowaway, swung back and fell 15′ to the deck. It was three weeks before he was fit for light duties again. “With Cheney laid up and one man on the wheel, that leaves three of us in our watch to run the whole ship! But whenever there is a sail to lower on the other watch, the mate calls for all hands.” The captain and mate caught an albatross with a baited hook, killed it and dressed it ready for cooking. This was considered to be bad luck by some of the crew and the carcass was summarily pitched overboard during the night. July 2nd: The ship was nearing Cape Horn in mid-winter with constant demands on the crew and 16 hours of darkness at night. McPhee wrote “A bad storm, on deck 20 hours at one stretch. Took in all sails but making as much as 4 knots. When the sun rose the next day, all hands saw that the cargo had shifted, giving the ship a dangerous list to port. Any further movement could start a slow capsize. Many ships had been lost this way, with the crew struggling vainly to restow the cargo or dump it overboard. July 10th: “Double occasion today. First it is my birthday and second, we passed the Horn and were in the Atlantic about noon. Raised the main, mizzen, jiger and inner jib, but the ship heeled so far we had to drop the jigger again.” The deck load continued to slide downhill until it came up against the stanchions and rail, which began to bend under the load. The Captain considered diverting to Montevideo to re-stow. While inspecting the lifeboats for storm damage, Bitte found they were rusted through. He soldered sheet metal over the weak spots and plastered them with cement on the inside. Things weren’t getting any easier for the crew. July 22nd: McPhee noted “Snowed all day, heavy wind. On this tack we are heeled to windward and ship a lot more seas, but they might straighten her out. Doing about 8 knots with 2,300 miles to go.” Surprisingly, this worked and the deck cargo slid back into the center, where it was re-lashed. On July 25th the outside world was remembered when Bitte wrote “The news over the radio isn’t good with Russia about to lose the Caucasus and Rommel in Egypt. The machinery is going to pieces faster than I can fix it.” In case they were surprised by a German submarine or raider, the crew slept in their clothes, kept their valuables in their pockets and prepared emergency food and water supplies. However, As the Tango drew closer to Capetown, the captain worried more about submarines and even ordered the generator shut down. The silent ship sailed on without lights. After 105 days without sighting land or another ship, McPhee climbed a mast and caught the first sight of Table Mountain and the African continent. Soon after, he spotted a ship approaching them. Was it a friend of foe? The crew held their breath until a plodding Liberty Ship came up astern, then the breeze picked up and the Tango pulled ahead. A tug came out and pulled the last American windjammer into Capetown, South Africa. On its 22nd and last successful voyage around the Horn, the Tango had covered 15,000 miles at an average speed of 6 knots. Only those who needed medical attention were allowed to go ashore. Bitte managed to send a cable home. No agent arrived to pay off the crew, who were now seething against the officers, the owners and the system in general. They filed a complaint with the U.S. consul charging that the Tango was unseaworthy and that the lifeboats and pumps should be replaced. After nearly 3 months in port, five replacements for sick crew arrived for the 750-mile leg to Durban. They passed through the flotsam from a sinking and saw flares on the horizon. On December 7th, one year since Pearl Harbor, the ship sailed into Durban. The first thing they heard was that the Star of Scotland had been sunk in mid-ocean! A few days out, the crew were confronted by a German submarine, which ordered them into the lifeboats. The mate fell overboard and drowned, but the rest of the crew survived. Their ship was sunk by gunfire on Friday 13th of November, 1942. Now began the last phase of the ship’s colorful career, somewhat reminiscent of the long, strange stay in Baja California during the First World War. The cargo was discharged and Fred Bitte was paid off along with four others. He was given a ticket to New York on the British steamship Athlone Castle. His place was taken by Richard Berlin of Seattle, who had just survived the sinking of the Star of Scotland. Six months passed at the dock. Since South America and most of Africa was not involved in the hostilities, there was still a peacetime trade taking place across the South Atlantic. The Tango was loaded with coal for Santos, Brazil, but on departure day a tug slammed into her bow. More delays ensued while repairs were made. With a heavy cargo loaded deep in the holds, the Tango rolled much more quickly, which caused the sails and spars to slat heavily. Ironically, the gear was strained in a calm with a heavy swell, then broke when the wind returned. After a trying week they had only made good 200 miles. Severe storms followed with winds up to 60 knots blowing out sails and exhausting the new crew. The heavy canvas continued to disintegrate until only one gaff sail and one jib could be set. When the wind fell light, the ship’s foul bottom lowered the speed by as much as a third. Yet spirits rose during the calms, when the sailors found a new diversion. They would catch an albatross on a baited line, bring out the phonograph, then dance around the sidedecks with the bird waddling after them. Despite the crew’s continued efforts, the sea won the battle and drove the ship back along its track. The passage lasted 38 days; at the end of it, the Tango was back in Durban. This time they stayed eight months. Most of the cargo was removed until the ship sat in ballast. A change of plan was called for: the Tango was to be sold to a Portugese owner. Archie McPhee was promoted to second mate before the ship set out again on February 9th 1943. Only five of the original, northwest crew remained. On the Tango’s last passage there were seven nationalities on board — a multi-cultural bunch that recalled the good old days of the age of sail. On the second day out, smoke and gases began escaping from the hatches. This was the worst nightmare for any sailor on a ship with only primitive motors and pumps–that the cargo would catch fire. The crew steered the ship north along the east African coast hoping to reach Lourenco Marques in Portugese East Africa, (now the capital of Mozambique). The luck of the Tango, ex-Mary Dollar, ex-Hans, was fast running out. There were no buyers for the 1500 tons of coal that subsequently had to be given away. It was June 1944 when the ship’s papers were officially transfered and the last crew paid off. Ira Cheney had been on the ship the longest–2 1/2 years. Another year passed before the re-named Cidade do Porto was loaded, ironically with coal again. The story was familiar: headwinds, blown sails, stops in Durban and Capetown. The last leg of the journey to Portugal was made under tow. The once-proud ship never moved from the Tagus River until 1948, then it was a last journey to the breakers. One member of the Tango’s original crew survives, he is Gene Luce, the radio operator, who was an 18-year old working at Boeing in Seattle and also attending a beginners’ radio class at the YMCA. Luce caught typhoid in Mozambique and was slowly nursed back to health at a British hospital in Aden. He retired in North Carolina and only heard about Larry Barber’s book from relatives after the first edition was published. Remarkably, the Tango’s sister ship, the Moshulu is still afloat and well in Philadelphia. After 25 years as a derelict, the rig was restored and the ship re-appeared in 1976 as the Moshulu Restaurant. A fire ended this business in 1989, but a recent search on the internet revealed that the ship is again open for lunch! 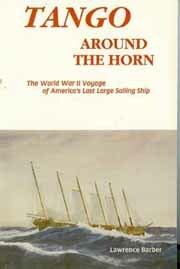 “Tango Around The Horn” by Lawrence Barber—the WWII voyage of America’s last windjammer from the Columbia River to South Africa. 254 pages & 35 illustrations. This entry was posted in Book Reviews, Nautical History, Sailing Ships and tagged Battle of Santa Monica Bay, California Casino Ship, Larry Barber, last American Windjamme, six-masted schooner Tango. Bookmark the permalink.